Eight boxes P, Q, R, S, T, U, V and W are kept one above another in a rack and each box having balls in prime number in between 20 to 70. They all are in different colours viz., Purple, Violet, Blue, Green, Yellow, Orange, Red and White but not necessary in the same order. Only two boxes are kept between the box which is in Blue colour and the box V, which is second from either from topmost or bottom of the rack. The box which has the number of balls one more than the perfect square of a number is kept immediately below the Blue coloured box. Only four boxes are kept between the box R and the Orange coloured box, which is kept below the box R. The box V is not in Orange colour. The box which is at fourth from the bottom has 6 balls less than the ball in the box which is third from the bottom. 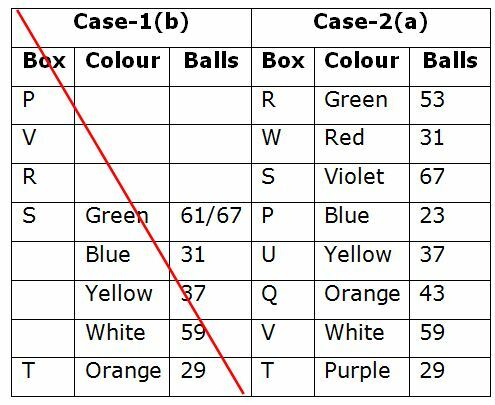 Only one box is kept between S and the box which is in Yellow colour, which is kept below the box S. The box S has the maximum number of balls. Neither the box S nor the box which is in Yellow colour kept at either bottom most or topmost of the rack. None of the boxes has 47 balls. The box which is in White colour kept immediately above the box T. The box which is in White colour has the balls one more than double the balls that box T has. The box T does not kept immediately above or below the box S and also not in Orange colour. Only two boxes are kept between the Green coloured box and P, which has least number of balls. The box P does not kept at the bottommost position.The violet coloured box is kept immediate below the box W and the difference between the balls in the both boxes are perfect square of an even number. As many boxes kept between the box P and the Red coloured box is same as between the box U and the White coloured box. 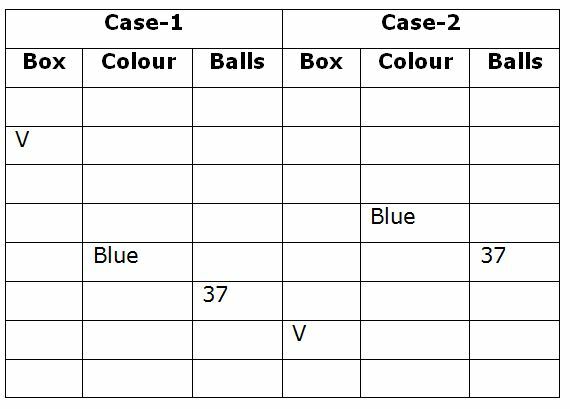 The box R has more number of ballsthan in the Orange coloured box and less than the balls in the box V.
1. The box Q has how many balls? Only two boxes are kept between the box which is in Blue colour and the box V, which is second from either from topmost or bottom of the rack. The box which has the number of balls one more than the perfect square of a number is kept immediately below the Blue coloured box. Only four boxes are kept between the box R and the Orange coloured box, which is kept below the box R. The box V is not in Orange colour. The box which is at fourth from the bottom has 6 balls less than the ball in the box which is third from the bottom. 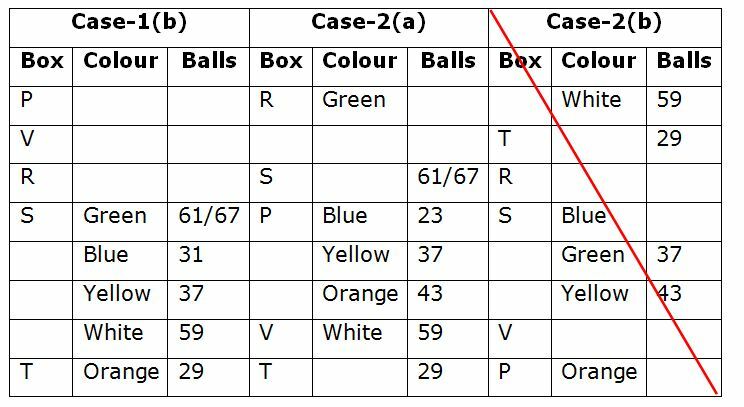 Only one box is kept between S and the box which is in Yellow colour, which is kept below the box S. The box S has the maximum number of balls. Neither the box S nor the box which is in Yellow colour kept at either bottom most or topmost of the rack. None of the boxes has 47 balls. The box which is in White colour kept immediately above the box T. The box which is in White colour has the balls one more than double the balls that box T has. The box T does not kept immediately above or below the box S and also not in Orange colour. Only two boxes are kept between the Green coloured box and P, which has least number of balls. The box P does not kept at bottommost position. The violet coloured box is kept immediate below the box W and the difference between the balls in the both boxes are perfect square of an even number. As many boxes kept between the box P and the Red coloured box is same as between the box U and the White coloured box. The box R has more number of balls than in the Orange coloured box and less than the balls in the box V.
2. How many boxes are kept between the box V and the box which has 43 balls? 3. Box P is in which of the following colours? 1)The box Q has how many balls? 2) How many boxes are kept between the box V and the box which has 43 balls? 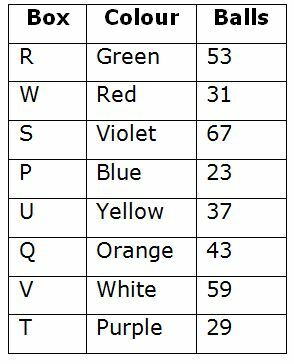 3) Box P is in which of the following colours?